Two Runoff Elections: Your Votes Sure Could Make a Difference, Or Is That Really So? Tomorrow we have two runoff elections where we can vote in the race for the Office of Comptroller between City Councilmen David Yassky and John Liu, and the race for Office of Public Advocate between two-term former Public Advocate Mark Green and City Councilman Bill De Blasio. It is amazing to think how much difference our votes could make. The phones in our household have been ringing off the hook. Hardly anyone votes in primary elections even though with the Democratic majority in New York City they tend to determine final outcomes in the general election. The turnout in the primaries two weeks ago was exceptionally poor with some races being determined by a matter of just hundreds of votes. We heard that there was one election where just SIX votes made the difference. Do you think that too few people show up to vote in a primary? The number goes down drastically in a primary runoff election like the one scheduled for tomorrow for the Comptroller and Public Advocate Office races. No wonder that our phones were ringing off the hook given that our household is now verging on its fourth voter. We tend to vote in a block and we drag other people along to the polls. We also hope that our Noticing New York opinions focusing particularly on development concerns in the city can swing other votes. Expect then that your vote tomorrow is going to count much more proportionately than in practically any other election! Too bad then that it is not clearer how much a difference your vote will make in terms of determining public policy on development. We covered the races for these two offices before, in advance of the first primary (Monday, September 14, 2009, Our thoughts on Navigating the Voter Minefields When All the Candidates Know the Words to Mouth on Development). Now that we are down to the runoff it is time for an update. The update we have on the race for the Office of Comptroller is that we basically have no update. We have to refer you back to the guidance expressed in our prior post. Both candidates have been good in a number of ways on issues of development. For instance, both have said some good things respecting their opposition to the Atlantic Yards development. On the other hand, both candidates could have been even stronger in their opposition to Atlantic Yards, particularly now, particularly with the additional new giveaways by ESDC and the MTA and the report by the city’s Independent Budget Office that the proposed Nets arena will be a $220 million net loss for the city. Then there are accompanying revelations that there is little reason to expect that anything else more than the arena or anything actually benefitting the city will be built. Liu has heroically been in the minority many times opposing Bloombergian abuses including development issues and the extension of term limits. Yassky has probably not been right as often; and additionally one reason the city is threatened by four more years of Bloombergian style development is that Yassky voted for Bloomberg’s override of term limits. We warned him he shouldn’t have voted this way. If Yassky loses it will probably be this that costs him the election. The great thing about the runoff election is that the candidates got an extra two weeks to distinguish themselves on development issues. The disappointing thing is that we are not aware they made use of it. We are not aware of it even though ESDC’s board met and voted on Atlantic Yards on September 17th. We admit though we could still be influenced by some strong last-minute statements on development by either candidate. In the Public Advocate race we think the candidates could also have made better use of the last two weeks to address development issues. We also have this to say. Some have suggested that if Mark Green gets a third term as Public Advocate, it will be a sort of swan song for him in a familiar role he has played before and he will thereafter fade away. I have also heard activists express the hope that if Green becomes Public Advocate again they might be able to sway him to see some common sense on Atlantic Yards and give up his support. Who knows? Conversely, it is thought by almost everybody that Bill de Blasio intends to use the Public Advocates office as a stepping stone toward higher offices. This raises concerns that Mr. de Blasio will not take good positions on development when he obtains higher office. The concern is that he will be much too much under the sway of the real estate industry. What makes this concern real is that Mr. de Blasio should have been a much stronger opponent of Atlantic Yards for years now. He has an informed constituency that opposes the project. His constituency should have been able to persuade him to take a much more principled position on the megadevelopment, including its poor design, its abuse of eminent domain and between $2-$3 billion in no-bid giveaways and a monopoly to a single developer. Furthermore, the megadevelopment has degraded significantly over the years but de Blasio has not taken advantage of such degeneration to correspondingly move away from it and roundly chastise the abuses.- - De Blasio could and should have gone a lot further to distance himself from the megadevelopment: Just this morning on the Brian Lehrer show segment on eminent domain WNYC reporter Matthew Schuerman was there to provide information about candidates’ positions was commenting how the anti-Atlantic Yards political climate has forced both de Blasio and Yassky to beef up their expressed opposition to Atlantic Yards. One important way in which the Public Advocate interacts directly with New York City development is through the Public Advocate’s appointment of one of the members of the City Planning Commission. We therefore decided to raise this issue with both the Green and de Blasio campaigns and specifically to ask each of the campaigns about Karen A. Phillips, the commissioner appointed by Betsy Gottbaum, the current Public Advocate. We wanted to know if Ms. Phillips might be likely to remain in office if either candidate were elected. We also asked generally what standards and principles would be involved in determining who would represent the Public Advocate on the CPC board. For the Green campaign we can say this. We received no response. That nonchalance certainly seems a strike against the campaign. We are entirely focused on our campaign for the runoff and will not be making decisions regarding the City Planning Commission until after Tuesday. We would have thought that this was the campaign for the runoff! The reason we asked about Ms. Phillips as commissioner is that she has been an excellent commissioner, bringing to the Commission what is sorely needed. We haven’t reviewed and cannot therefore vouch for every position she has taken but, for instance, her courageous dissenting position on Columbia’s proposed expansion and takeover of West Harlem abusing eminent domain was astute, principled, minutely reasoned and well documented. Whoever is elected to the office of Public Advocate, we suggest that everyone pay attention to whether they keep Ms. Phillips in place as a commissioner, and if they don’t, pay attention to the possible haste in which they may act to replace her. In sum, your votes tomorrow will in proportionate mathematical terms make a huge difference in terms of the election. However, we wish we could say that it is satisfyingly and correspondingly clear that voting one way or another will make an important policy difference. We are open, though. We can be swayed by such last-minute statements we may hear from the candidates. We welcome anything they submit. And we do have a Noticing New York comment section- Or we will post an updating post if appropriate. Good luck tomorrow. We do advocate that you vote. In one of Norman Oder’s Atlantic Yards Report posts today (The orchestrated timing of the Prokhorov deal: just after the main opportunity for public agencies to ask questions) he noted that we had wondered in our recent post (Friday, September 25, 2009, Should Public Agencies Approve Prokhorov as New Nets, Arena and Atlantic Yards Owner?) about whether ESDC would approve the Prokhorov transaction. Michael D.D. White, in his Noticing New York blog, wonders whether the Empire State Development Corporation could disapprove the Prokhorov transaction and suggests it might. I'm not so sure, given that the ESDC's agreement would still be with the majority owner of the Atlantic Yards project and arena. He went on to provide further musing of his own respecting the issue we raised concerning the awkward situation that could be in store if scarce housing bonds and subsidies have to be approved with Mr. Prokhorov in place as an Atlantic Yards megadevelopment owner. The question of whether ESDC MIGHT disapprove the Prokhorov transaction is an interesting one worth coming back to. Certainly, ESDC SHOULD be able to approve the transaction as in it OUGHT to be able to approve transfers. The extreme hypothetical example is that Ratner should not be able to transfer his project to well-known members of the Mafia. Information about Prokhorov is not yet fully unearthed, known or examined but the mention of possible ties to Russian organized crime certainly takes us part way down the road to dealing with this sort of awkward question. Then there is the question as to whether ESDC COULD disapprove the Prokhorov transaction as in whether ESDC is ABLE to disapprove it. The scandal is that Ratner negotiated a provision in the documents that would seemingly permit FCR to transfer the project to anyone, well-know members of the Mafia, or to Prokhorov. This is typical of the extensive panoply of one-sided giveaways of which the Atlantic Yards transaction is comprised. But we pointed out that that document provision is likely inoperative and academic in that there is probably no executed deal by which it would be enforceable. The MTA and ESDC boards have been so busy authorizing new freebies to Ratner worth hundreds of millions of dollars that it is doubtful that those deals have been fully written up and signed. Ergo, ESDC (and through it the City of New York) is not bound to go forward with the transaction. That gives ESDC the de facto right to approve the entrance of Prokhorov. It also give ESDC the opportunity to fix its documents to include proper approval of transfer provisions. The same is probably true with respect to the MTA. Given ESDC’s (and the MTA’s) probable de facto ability to disapprove or approve Prohorov, the next question is whether ESDC, the MTA and the city will actually make sure to conduct a responsible review so as to exercise this right. That gets us back to the question of whether ESDC MIGHT disapprove the Prokhorov transaction. Given ESDC’s perpetual habit of deferring to Ratner initiatives (that by definition is the construct AY is anyway) we can predict that ESDC, the MTA and the city would have an impulse to try to sidestep review and approval of Prokhorov. That, we submit, would be a sidestepping of normal public agency responsibilities that OUGHT NOT to happen. It is also fraught with the danger that if future news surfacing about Prokhorov turns out to be a lot worse than currently envisioned, the agencies will look like they were negligent and foolishly submissive to Ratner (and Prokhorov). . . not that this has ever troubled them before. Monday-morning quarterbacking pundits will criticize the agencies for a lot: not foreseeing the advent of Prokhorov, not having transfer provisions in place to kick start normal review routines and not acting to fix the situation when Prokhorov showed up to make those deficiencies pretty obvious. Better that the agencies conduct a review now and put in their files the reasons why they are approving or disapproving Prokhorov. Better that they do this even if they subsequently turn out to be wrong about approving him. If ESDC, the MTA and the city do not follow their impulse to defer to the developer and instead conduct a review of Prokhorov and subject him to an approval process, we can predict what the agency approval process will probably be like: The agencies will almost certainly bend over backwards to approve Prokhorov. If the agencies discover incriminating things about Prokorov (and there probably will be things they discover that raise hard questions), they will probably go out of their way to find reasons why significant concerns should theoretically be dismissed. So, COULD ESDC disapprove the Prokhorov transaction as in MIGHT ESDC disapprove the Prokhorov transaction? It is highly unlikely that ESDC WILL “disapprove the Prokhorov transaction.” AYR is right to be dubious about that possibility. Finally this: If it ultimately comes out, based on future disclosures, that approval of Prokhorov was ill-advised, don’t misconstrue anything in ESDC’s, the MTA’s or the city’s files about why the approval was given as documenting an honest defense. You can presume that, irrespective of what is in those files, the agencies were straining to read whatever telltale signs presented themselves just one way, that the agencies were looking to make sure that another request from the developer would be fully acquiesced to, completely unimpeded. The timing of the deal with Mikhail Prokhorov seems clearly orchestrated, in the works but not announced until after the Atlantic Yards plan received its second approval, on September 17, from the Empire State Development Corporation. The project was approved September 17. The deal was announced September 23. Was it orchestrated for such deliciously close timing just by Ratner without ESDC knowing? We think that despite what may be absent from the board materials, ESDC staff must have known what was being orchestrated. By wondering `who knew what and when’ (Mr. Bloomberg? Mr. Paterson?) you can get a pretty good inkling what this orchestration says about what is intended in terms of keeping Prokhorov in place. Here is something else to wonder. We have noticed the absolute flood of articles being rushed out about Prokhorov in every conceivable publication. How much of that is due to public relations press feeds that were prepared well in advance of the orchestrated events? We watch for the weekly Thursday publication of the print edition of the Brooklyn Paper to see what shows up in its mailbag. We watch with special interest if we have comments on a Brooklyn Paper article that might show up there. This week we were disappointed and a little surprised that the mailbag didn’t include what we thought was our timely submitted and crucial correction to the paper’s article on the projected financial damage to the city if the proposed Nets arena goes forward. The paper’s mailbag this week did include interesting and worthwhile letters. At least two of them are about Atlantic Yards, perhaps a third if one includes the letter of admonition to Steve Levin. Mr. Levin is the candidate who won the Democratic nomination for the 33rd City Council seat being vacated by David Yassky. The letter admonishes Mr. Levin to live up to his pledge to be a fighter independent of “Brooklyn Democratic Party leadership” by which the writer probably meant Assemblyman Vito Lopez, for whom Mr. Levin used to be chief of staff. Maybe Mr. Levin will be an independent fighter. He told us he had wanted to make it to the September ESDC board meeting to speak against ESDC’s approval of the bagful of giveaways to Ratner- But he didn’t actually make it. The good thing about Noticing New York is that if we see that Brooklyn paper has not published comments we think it should have, we can publish them right here. So here we go. Your article (with the print headline: “Report: Arena will cost city $40M over 30 years”) is inaccurate and misleading. The arena will “cost” the city $40 million over 30 years? No, the arena will cost the city a great deal more, hundreds of millions of dollars. What the City Independent Budget Office is writing about is the NET LOSS to the city and it conservatively calculates that net loss at a much more substantial figure: $220 million ($39.5 million in direct losses and $180.5 million in opportunity losses). Further, if you noticed, that figure, only for the arena, has already begun to rise. This week at its board meeting, ESDC casually shook the advance of another $25 million out of its sleeve. Since the project is unlikely ever to return the accelerated advance of that money, this extra $25 million could well bring the calculated net loss from $220 million to $245 million. The print headline is particularly misleading ushering in dismissal (i.e. “al pankin” or “Johnny from Kensington”*) that all that is being talked about is a $40 million “drop in the bucket” overall expenditure or “peanuts for the city budget.” Not so. Among other things, per the IBO report, we are talking about $726 million in no-bid giveaways for the developer just for the arena. Ultimately, for the total project, we are talking about more than $2 (perhaps $3) BILLION that could be better spent elsewhere. Finally, since the as yet UNDESIGNED rest of megadevelopment has been formulated as a multi-decade no-obligation developer monopoly on a swath of valuable Brooklyn real estate, it will allow the developer to blackmail the public into deeper subsidies redoubling ultimate total net losses. Should Public Agencies Approve Prokhorov as New Nets, Arena and Atlantic Yards Owner? Would It Ever Have Been Approved in the First Place? Prokhorov has been accused of asset stripping, abuse of corporate governance and violations of minority shareholder rights. He was arrested in France in 2007 on suspicion of involvement in a prostitution ring. . . the reported link of the Russian aluminum giant, UC Rusal, with organized crime. So, if you were a public agency having to approve Mr. Prokhorov as the substantial recipient of billions of dollars of public subsidy, you would be asking questions about whether you could possibly disregard the incident involving the planeload of prostitutes given that Prokhorov was released without charge by French authorities. You would wonder if that meant that he had actually done nothing wrong or only that his $14 billion in wealth (down to $9 billion now) helped him tell a convincing story to the French authorities about how he was only importing the girls for his Christmas party. Does that mean that he gets off as just being the client-john? That he was not procuring for his own commercial benefit when he supplied the guests at his Christmas party? Does that mean that under United States law he would also have been released just as the socially tolerant French did? Consider this: State, city and federal agencies do background checks before they will provide housing subsidies. An embezzlement such as occurred at ACORN could certainly disqualify a group like ACORN from subsidy funding. (As noted, ACORN certainly gets such subsidy funding.) At the very least it must needs be a matter of significant concern to public agencies. It is the kind of thing they must bring to the attention of their upper-echelon decision-makers and their board members if they have a board. Should there then have been any doubts about the definite problems with the culture at ACORN? If a public agency still gave ACORN the benefit of the doubt they would surely be regretting it in light of the recent ACORN prostitution video scandals. Ah, the lure of the commercial benefit of illegal prostitution raises its pesky head again! Interesting, the caliber of people these Atlantic Yards people wind up consorting with. You don’t suppose that it will turn out that former governor and Atlantic Yards supporter Eliot Spitzer spent any Christmas time with Mr. Prokhorov? As a result of the most recent incident Congress has been voting about whether government funding of ACORN must be terminated. For the same reason we may assume that the IRS is severing ties with ACORN (Acorn Sues Over Video as I.R.S. Severs Ties, by Sarah Wheaton, September 23, 2009), because ACORN cannot be depended upon to properly certify income information or give honest tax guidance, the public housing agencies should not be making ACORN a channel for the provision of affordable units which involve the same kind of certifications of income for eligibility under IRS provisions. For another slice on the way these entities are apparently incapable of properly handling their conflicts see: Thursday, July 9, 2009, A Street Encounter Raises Questions About The Working Families Party, ACORN and Atlantic Yards That Seem To Lack Satisfactory Answers. It is not just at the outset that public agencies regularly do background checks when they hand out benefits. You should also know that public agencies typically do background checks when projects are transferred. Otherwise the initial background checks would be meaningless. The question is whether the MTA and Empire State Development Corporation, which have been very busy handing out freebies to the Atlantic Yards mega-project (without measuring or caring about benefit in return) will draw the line at Mr. Prokhorov, now stepping in to be the recipient of such unqualified largess. Interestingly, to the extent that ESDC’s Modified Project Plan speaks to this it would seem that its drafter (who probably should be presumed to be Forest City Ratner) would like ESDC to have absolutely no ability to reject Mr. Prokhorov. Note how weak the modified project plan paragraph on transferability (on page 32) is on this subject, another obvious Ratner giveaway. The agreements with the Project Sponsors will provide that until the applicable building or improvement within Phase I is substantially completed, the applicable portion of each Parcel may not be transferred by the Project Sponsors, without the consent of ESDC and the City, except to affiliates of FCRC and in connection with financing transactions and/or the enforcement of rights of lenders under these financing transactions. 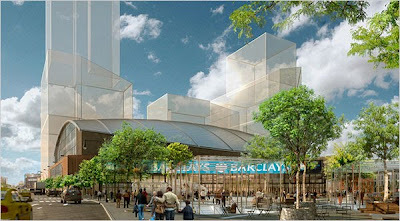 In addition, in the event the Nets professional basketball franchise is sold to another entity prior to the completion of the Arena, Project Sponsors may transfer their interest in the Arena to the purchasing entity or its affiliate, provided ESDC and the City are reasonably satisfied that such entity can satisfactorily complete the development of the Arena or if such entity retains the Project Sponsors to develop the Arena. Would ESDC try to disapprove the transfer based on inability to complete? 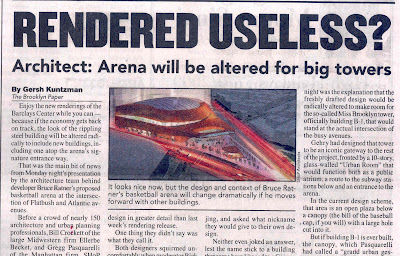 Ratner would just thwart such a potential disapproval by being retained to complete the arena. We know that as part of the recent public hearings on the additional giveaways to Ratner, public comment was submitted questioning the weakness of the transferability provisions. We don’t, however, see that the subject of transferability of the megadevelopment was addressed in ESDC staff write-up of the public comment and responses issued to its board at the September 17 board meeting. Here is a very possible answer to the question whether ESDC has the right to approve the Prokhorov transfer. They probably do. Not because the transferability section of the Modified General Project Plan says they do but because it is very likely ESDC has not signed the current deal. In all likelihood it is still being written up. Those who have been tracking Atlantic Yards will remember that at the June 22, 2009 MTA Finance Committee meeting it was revealed that after five long years the MTA had never ever signed a deal with Forest City Ratner! (And politicians had once been worrying how difficult it would be to terminate the deal with Ratner! Ha!) Until signed, ESDC and its board can always revoke any approvals given. ESDC's board only just approved the last deal dumping, among other things, an unexpected extra $25 million on Ratner at the last minute. It is a good bet that Ratner, who perpetually tries to squeeze more out of every deal, has not negotiated to his ultimate satisfaction. By the same token the MTA may not have signed their new deal either. That puts ESDC and the MTA on the spot. Do they want to approve this deal with Prokhorov? We would imagine that Mayor Michael Bloomberg and Governor Paterson have at least checked in with the public agencies’ staffs about their ability to send Prokhorov packing, especially if the news gets any worse. Bloomberg though, in a one-wealthy-oligarch-to-another sort of way may not have been too urgent about his inquiry. But even if ESDC and the MTA manage to somehow sidestep the question of such approval or even if they do approve Prokhorov, the next question is the review that Prokhorov will need to be subjected to if he is to be a major participant in owning the rest of the project. After all, everyone knows that the arena is projected to be at least a $220 million net loss for the city. The ostensible reason for proceeding with this mega-project anyway was that affordable housing might speculatively be provided someday. Well, if Prokhorov has to be involved, the awkwardness in redirecting housing subsidy away from other housing developers to the Prokhorov tainted team becomes pronounced. The housing, per se, becomes less likely. For ESDC and the MTA to approve the new Prokhorov deal now makes for exceedingly awkward nonapprovals in the future. The idea that the proposed Moynihan Station might finally begin to move forward is just one of many “good news” announcements we are going to be hearing about respecting New York City development now that the Bloomberg is revving up to come down the election home stretch. This weekend we heard about the plans for a colossal new shark exhibit at Coney Island Aquarium and last week we also heard about plans for development of the Homeport development in Stapleton, Staten Island near the ferry at St.George. The public is being further titillated by the projection that spurs having been kicked so that the first phase of the long-delayed Brooklyn Bridge Park will be open by December, just two months after the mayoralty election. Really? Noticing New York is betting that one piece of “good news” that won’t be trotted out is that redevelopment of the Ground Zero World Trade Center site is proceeding faster than planned. The slow pace of activity there was recently lambasted as a national embarrassment in discussions on Real Time With Bill Maher. The Bloomberg administration is unlikely to want to remind the public how Bloomberg has handled Ground Zero which was one Bloomberg’s most clear-cut opportunities to prove his development credentials immediately after he was elected to his first term. The Times editorial places the blame for the what has previously been a delaying misfocus onto the Port Authority of New York and New Jersey and Governor Paterson. It fails to mention that a huge amount of the distraction from what would have been a proper focus came from the Bloomberg administration. As of the spring of 2003, with things sufficiently settled after 9/11, the project was supposed to have been completed by 2008. It hasn’t even been begun. Why? Our public officials put the public project in the hands of private developers to diddle with. . . .
. . . So what happened when the public train station was turned over for developers to take the lead? For the developers it became all about making profit on adjacent properties. Things went so far afield as for the developers to focus on whether they could acquire and tear down Macy’s, “the world’s largest store” in order to build huger and huger buildings in the vicinity! No wonder the possibility of proceeding in 2003 with any ghost of the 2008 “completion date” came and went. If you are not building a new train station but negotiating to buy and redesign a whole neighborhood with the goal of putting private developer profit in your pocket, you are talking a whole different time frame and the lead winds up being taken by entities whose eye is on a different ball. Trust us. These expansively wild dreams were not being entertained without the support of the Bloomberg administration. Clearly indicative of this is the fact that when Daniel Doctoroff, Bloomberg’s former deputy mayor for development, left the mayor’s administration to go to work for the mayor’s Bloomberg, LP, Doctoroff made a special trip to the city’s Conflict of Interest Board where he was (we say inappropriately) given the right to continue working on Moynihan Station while no longer technically a government official. (See: Doctoroff Wants to Stay Involved with Hudson Yards, Moynihan, by Matthew Schuerman, December 6, 2007) For more on some of Doctoroff’s and the administration’s other conflicts see: Tuesday, February 3, 2009, The Good News IS the Bad News: Thanks A lot for Mayor Bloomberg’s “Charity” (Part II). At this point, this move seems like another complication for a project that is already about as complex as public works can get. For one thing, the old Macy’s building has national landmark status and needs to be protected. Also, moving Macy’s to 32nd Street raises new questions about whether that part of the Moynihan complex would become more shopping mall than railroad station. Then, that station can finally be named for the man who championed the whole idea: Senator Daniel Patrick Moynihan. We will have more comment on that at the end of this post. First, let’s look at some of the “good news” projects that the Bloomberg administration is trotting out for press events because it says something about the way the Bloomberg administration does or does not move things forward. “With the city’s plan to revitalize the amusement district, Coney Island is poised for exciting growth and the New York Aquarium is an important part of that vision,” said Bloomberg. . . Still, the city remains at odds with Joseph J. Sitt, a developer who owns 10 acres and once had his own redevelopment plan for the area.
. . . the timing “couldn’t be better” for the project, because the City Council had approved the city’s plan to redevelop the seafront district, once known as the world’s largest playground. Noticing New York’s Testimony at Today's City Council Hearing on Coney Island, Tuesday, July 14, 2009, City’s Coney Island Plan: Our Skepticism of Times Editorial Credulity, Wednesday, July 15, 2009, The Jane Jacobs Way for Coney Island, Friday, July 10, 2009, This is the Coney Island the Bloomberg Administration Doesn’t Want the City to Have!. In terms of saving Coney Island it would have been good if the Bloomberg administration had been moving on investing in the aquarium long before this third-term election cycle. The wildlife society has long wanted to revamp the 52-year-old aquarium in Coney Island, which attracts about 750,000 visitors a year. But the city rejected one plan last year because it provided for new exhibits but failed to transform the building’s exterior and create a more engaging link to the Boardwalk and Surf Avenue. It’s certainly not the first time someone has made that promise. Indeed, the latest renovation plans come almost three years after the city proposed, and then scrapped, a much ballyhooed aquarium rehab that called for an entirely new look. In the continuing effort to revive the local economy and spruce up local neighborhoods, Mayor Michael R. Bloomberg announced on Wednesday that the city has secured a commitment from the Ironstate Development Company to invest $150 million to revitalize the underutilized Homeport site in Stapleton, Staten Island.
. . . a project that's been discussed by local business leaders and city officials for years, but has seen little action. Local observers on Staten Island expressed skepticism about the likelihood of any project moving forward at the waterfront in the current economic climate. In his 2005 state of the city address, Bloomberg compared the Homeport to Mark Twain's description of the weather: "Everybody talks about it … but nobody does anything about it." “This is a viable plan in a very difficult market,” said Seth Pinksy, president of the city's Economic Development Corp., in a statement. Let’s see what happens after the election. Even if one can question what the city can currently afford and whether all of the waterfront area now available for new use should become park, the precept that a city park should “pay for itself” has created confusion and uncertainly about design and management that compound exponentially with the vagaries of an erratic real estate market now on a downward trajectory. As a consequence, there are valid concerns about the unpredictable answers as to just what development may happen. There are equally valid accompanying concerns that the mystery development that finally materializes will be driven by factors other than what normally makes for good urban design and zoning. Earlier on, we noted that Friday’s Times editorial about how plans for Moynihan Station should finally proceed ended with the Times’ suggestion that one reason Moynihan Station should finally move forward is that when it does Senator Daniel Patrick Moynihan can finally be appropriately honored. We promised we would revisit this with an additional comment. 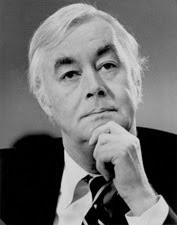 Senator Moynihan took principled positions about the proper division of roles between the private and the public sector. One thing he fought hard for on that score was NOT to have the public finance sports arenas and stadiums with tax-exempt bonds. Much of the focus of Bloomberg officials has been on unwisely overriding the Moynihan prohibitions on such financing. The Bloomberg administration has sought to do so even when, for instance, an arena like the proposed Atlantic Yards Nets arena would be a $220 million net loss to the city. Bloomberg has sought to do so even when financing Yankee Stadium meant criminally falsifying city tax assessment records and risking the cost and ignominy of having city tax-exempt bonds declared taxable. 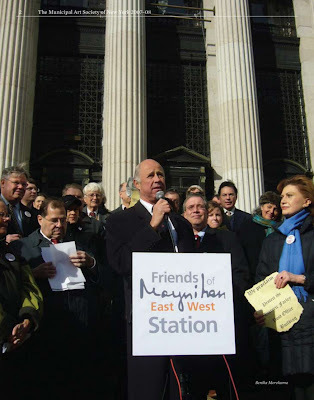 We think it is clear that proceeding with Moynihan Station would indeed honor Senator Daniel Patrick Moynihan. We think it would honor the senator for more reasons than the Times envisions. It would honor him by materializing his vision of the glorious train station, but we would also be honoring him by setting aside Bloomberg’s detrimental focus on trying to transform public projects into special gifts for private developers. We could honor Senator Moynihan greatly in many ways by casting Bloomberg and his ineffectual developer-oriented style to the wayside. Too bad the Times didn’t think to point out that one of things we could do immediately to honor Moynihan is NOT finance the Atlantic Yards arena. Finally, if the Bloomberg administration’s focus had been where it belonged for the past eight years perhaps we would be hearing more about what the administration had done in two terms rather than what it was going to do in its third. I do think that if you take a look at the real world, of how long it takes to do things; we live in a litigious society, we live in a society where we have real democracy and lots of people have the ability to INPUT their views and approve or disapprove projects. Some of Bloomberg’s developments may have been held up by litigation, but mostly they have been held up by his own misplaced focus, and if some have been litigated against, that too is largely the result of his own misfocus which has resulted in projects, often mega-projects, that are on top of everything else incredibly poorly designed. What a difference just a matter of days can make! Just days after Forest City Ratner released renderings of the fourth version of its proposed Atlantic Yards arena, it has now released its fifth set of drawings of what the arena will look like. It is startlingly like the third version, the Ellerbe Becket “airplane hangar” design. The fifth version replaces the SHoP drawings and model that were masterfully furnished just days after conclusion of the public comment period and days before the Empire State Development Corporation’s meeting last Thursday where ESDC’s board granted Ratner permission to proceed with the arena plus a thirty-year monopoly on the adjoining acreage Ratner wants for whatever he eventually wants to do regarding the rest of the megadevelopment. 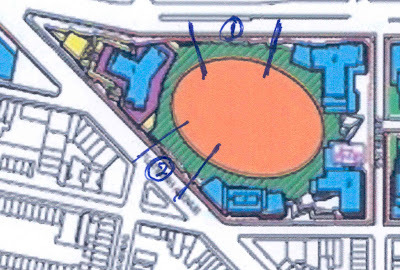 Thursday’s board meeting squared away, Ratner moved forward by surfacing the new drawings. Ratner’s spokesman, Joe DePlasco, explained that applying what he referred to as the concept of “value-accelo-engineering,” the new design eliminated all of the floating metal lattice surrounding the arena. He pointed out that this should please all the people calling for the project to proceed faster while at the same time it would save the developer money. Mr. DePlasco also explained that the new approach would spare the surrounding community being subjected to a great deal of unnecessary construction. “You have no idea how sensitive Forest City Ratner is about its neighbors in the community. This will avoid our neighbors having to be inconvenienced by the construction of the lattice and then doubly inconvenienced by the demolition of the lattice. All of those especially loud and dusty operations involving street closings now become unnecessary,” Mr. DePlasco pointed out. Mr. DePlasco said that he could not promise that the new approach would accelerate the developer’s provision of the “150-foot billboards on either side of the `Urban Room`” (see the Brooklyn Paper article) but said that this was indeed a possibility. “As you know,” he said, “earlier last week we said that animated, illuminated 15-story signs were not part of what was the current concept of the arena design, but the design now moving forward implementing the value-accelo-engineering definitely allows the signs to be part of the concept again and to be provided more swiftly.” “This is all within the ESDC design guidelines” Mr. DePlasco said, something he said he hoped everyone firmly understood. Surprised by the move, Gersh Kuntzman of the Brooklyn Paper asked Mr. DePlasco the obvious question for the next story Kuntzman has not yet had a chance to write (sometimes Forest City Ratner is moving so fast that not even Mr. Kuntzman or Mr. Norman Oder* can keep up). He asked what assurance there was that the new value-accelo-engineering approach wouldn’t simply result in a spare undecorated airplane hangar arena sitting at the corner of Atlantic and Flatbush for decades. “That won’t be the case,” said Mr. DePlasco, “I think it goes without saying that Forest City Ratner is committed to building the entire project as soon as possible and without delay” adding “Forest City Ratner is an organization which should always be trusted under all circumstances.” Mr. DePlasco said that as additional evidence of Forest City Ratner’s good faith and real commitment to speeding up construction of the arena, Forest City Ratner was considering advancing its promised opening date for the arena to the 2009 date it had previously used. Mr. Kuntzman observed that this could just be an airplane hangar arena with no buildings around it, something he predicted the public would object to. Mr. DePlasco said that insistence the lattice be built if it was going to be torn down again would be unreasonable. It would just be project opponents calling for the arena to wear a “wreath of thorns.” He said that the developer was not prepared to be a martyr about such things. “This megadevelopment has never been about imposing obligations on the developer,” he emphasized, something he said he could have ESDC spokesman Warner Johnston confirm. Contacted by Charles Bagli of the Times about the FCR smoke and mirrors vaportecture proposal, attorney and urban planner Michael D. D. White acknowledged that Forest City’s plan might well add “FRC’s buildings to the pantheon of well known nonexistent buildings” noting that “one of the best known nonexistent buildings in New York was the now demolished Pennsylvania Station.” “They decorate the new station with pictures the old Penn Station they tore down,” he said. Mr. White cautioned however that FCR’s nonexistent vaportecture buildings were never likely to become “nearly as famous” as the demolished Ward Bakery building which was now nonexistent on the same proposed Atlantic Yards project site just a few blocks away. - Verily, as was reported in the Brooklyn Paper, the steel the steel lattice IS being built (in theory) just to be torn down again. It would save the developer money never to build it and ESDC habitually accommodates virtually every request by the developer. Yes, the developer is truly only supplying PR nonexistent vaportecture architecture in lieu of designs for any the rest of the mega-project whose actual construction within the upcoming decades is entirely speculative. That’s all true. The fact of the matter is that all of what we have imagined above, even the return of the 15-story animated, illuminated billboards is permitted by the ESDC plan and design guidelines. So if you think there is something that would prevent it from actually happening . . . . Just think again. 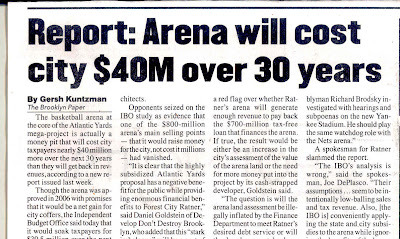 A spectacularly flawed project in almost all respects, New York City’s Independent Budget Office has concluded that the Atlantic Yards arena, the only part of the Atlantic Yards project currently designed or for which any kind of enforceable, documented deal exists will be a net money loser for the city to the tune of $220 million($39.5 million in direct losses and $180.5 million in opportunity losses). The megadevelopment’s guaranteed inadequacies flow principally from the fact that it was set up and concocted by the developer, Forest City Ratner, as a subsidy-infusion system intended to deliver maximum benefit to the developer at the expense of the public. The IBO has conservatively calculated that on the arena alone the city will be giving the developer$726 million in no-bid giveaways. The as yet undesigned rest of the megadevelopment has been formulated as a multi-decade no-obligation developer monopoly on a swath of valuable Brooklyn real estate that will allow the developer to blackmail the public into deeper subsidies, redoubling its net losses. In fact, just this week the developer caused New York Governor Paterson’s Empire State Development Corporation to casually shake the advance of another $25 million out of its sleeve. (See: Thursday, September 17, 2009, Noticing New York Comment on and at Today’s ESDC Board Meeting.) Since the project is unlikely ever to return the accelerated advance of that money, this extra $25 million could well bring the calculated net loss on the project up from $220 million to $245 million. The mega-project, containing the seeds for its own demise from the get-go, has been foundering embarrassingly for the five years since it was proposed. The developer could quite likely go under financially. There have thus been ample and repeated opportunities for responsible organizations to call for pulling the plug on the degenerating deal. We have written before about how Ms. Wylde has, instead, errantly recommitted her support to it no matter how far it degrades. (See: Monday, July 6, 2009, Wylde Ideas, Making For a Wrong Partnership.) 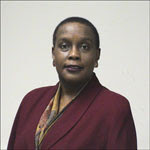 Most recently, despite a change in the economic environment which should have made it possible to get a much better deal for the public, Ms. Wylde endorsed a far worse one on behalf of the Partnership (see the article just linked to) where hundreds of millions of extra giveaways are being lavished on the project without quid pro quo. As we wrote, Ms. Wylde’s misguided support of this uneconomic megadevelopment, (and a prime reason it is uneconomic) is tied in with her misinformed support of eminent domain abuse in principle as well as specifically for Atlantic Yards. Eminent domain is used abusively to counter the natural beneficially creative forces of the economy. It, instead, favors politically connected would-be mega-developers. In New York State, eminent domain has become an industry, propelled and driven by the development entities benefiting from the abuse. (See: Columbia Pulls a Kelo, By Michael White, December 20, 2007.) It is used as a tool to create an economic shut-out of economic competitors. * The wealthy and connected are favored at the expense of the small businessman or property owner. For instance, eminent domain is used against small owners and businesses that are too economically vital to be bought out but it is never used, even when it might make sense against anyone who is in the big developers club. Many of those developers (like the failing Ratner) are purely subsidy collectors incapable of surviving in a competitive unsubsidized environment or one where they must compete for subsidy. Ms. Wylde supports the uneconomic abuse of eminent domain while denying its actual economic costs. Ironically, eminent domain proponent Wylde is taking her place on the Federal Reserve board alongside an infamous eminent domain abuser Lee C. Bollinger, President of Columbia University. One of the three highest paid presidents at a private university ($1.4 million annual compensation package), Mr. Bollinger has spearheaded Columbia’s usurpation of West Harlem using eminent domain to gain a multi-decade monopoly shut-out on the real estate there, very much like Atlantic Yards. Why is all this important to Ms. Wylde’s appointment to the Federal Reserve Board? What is the Federal Reserve supposed to do? It is supposed to “foster the safety, soundness and vitality of our economic and financial systems.” The Federal Reserve also has consumer protection responsibilities which Congress is now debating taking away. It is hardly an analogy to say that in the case of Atlantic Yards the public is the consumer and it is getting a pretty raw deal because of people like Kathy Wylde who are willing to defend the indefensible. (Pursuing of favors from political patrons like Bloomberg?) The Federal Reserve has also been the focus of attention recently as analysts ask whether its formulation and administration of the hundreds of billions in economic bailout money was overly focused on Wall Street, again shutting out the possibility of real benefit to the larger economy of smaller business on Main Street. For just one recent starter summary article on this subject, see Tenacious G, Inside Goldman Sachs, America’s most successful, cynical, envied, despised, and (in its view, anyway) misunderstood engine of capitalism. By Joe Hagan, Published Jul 26, 2009. The New York Federal Reserve is the largest and most powerful of the 12 regional reserve banks. 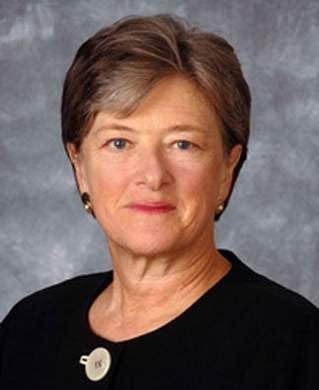 So, if you are wondering about what kind of biases might govern the Federal Reserve in conducting federal policy to protect the public and ensure soundness of the economy, just remember that two of its board members who are there to set policy and direction are Atlantic Yards, Bloomberg and eminent domain supporter Kathy Wylde and eminent domain abuser Lee Bollinger from Columbia. The New York Fed also has the ear of Washington, D.C.—U.S. Treasury Secretary Timothy Geithner was president of the New York Fed until his White House appointment. This post furnishes Noticing New York’s comments delivered at the ESDC board meeting today on “Atlantic Yards.” We have to put “Atlantic Yards” in quotes because “Atlantic Yards” is so ill-defined it is quite uncertain what it is other than a giveaway scheme to benefit a developer. 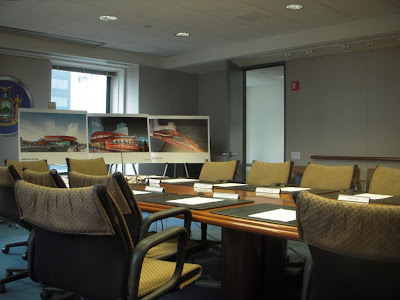 Norman Oder’s prolifically swift and fastidiously accurate Atlantic Yards Report has already started posting multiple accounts of the board’s meeting with the promise of more detailed accounts to come by this evening or tomorrow morning. It would be futile to race Mr. Oder to a full account of the details but we can offer our own comments and a few extra interstitial observations. We arrived early for the board meeting before any of the rest of the public and watched ESDC’s excellent support staff set up for the meeting, a tableau that reminded us of the tremendous resources that ESDC, for good or for ill, can mobilize in pursuing its goals. There was attention to “setting the stage,” getting microphone levels correct, hooking up the teleconferencing with the ultra-large high definition monitor. The court reporter showed up and plugged in her computer and other specialized devices. The just-released renderings of the new design for the “arena” were put on easels. We have been saying that the design is the third design for the arena but is actually the fourth. We forgot about the second Frank Gehry redesign of phase one of the mega-project. Word that Gehry’s second design was dumped reached the public Thursday, June 4, 2009, the same day the highly reviled “airplane hangar” design by Ellerbe Becket was released. Now the public has been informed that it was in the same month, June, presumable after the unfavorable firestorm reaction to Ellerbe Becket’s hangar that Bruce Ratner went to SHoP Architects to “figure out a way to make a beautiful building, and figure out a way to build it” because, in SHoP’s PR-speak Bruce Ratner’s “heart is really in making a fabulous design”and “we were convinced he really wanted to make a great building." As we watched, ESDC spokesman Warner Johnston came into the room and reviewed the easel displays. He commented, just as we already wrote, about how the most often featured rendering of the arena used the same colors depicting the arena to peculiarly illustrate the feigned time-lapse photography of “speeding” traffic on Atlantic and Flatbush avenues. We wrote about how we interpreted this peculiarity as an indication that the architects felt uncomfortable that they had not resolved the question of mitigating the huge scale of an arena shoe-horned into a residential neighborhood. 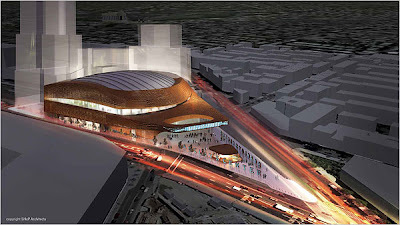 The rendering is the only one in which the scale of the arena amongst surrounding buildings is shown. For more on this see: Thursday, September 10, 2009, The Surrounding Light Smears Ratner’s Atlantic Yards Arena and Saturday, September 12, 2009, Really Now! The subject of Rendering the Atlantic Yards Arena Realistically Revisited. Why is all this important? In part because ESDC is trying hard to claim that it is reasonable not to do an environmental assessment that takes into account that the megadevelopment will likely take decades, twenty-five, maybe forty years. That, as DDDB’s Daniel Goldstein said when he spoke at the meeting, is what ESDC and Forest City Ratner officials admit whenever they are speaking candidly. It is also important because it is impossible to have actual plans for a multi-decade project. Things change too much. Office buildings become residential or vice versa. Condominiums becomes rental buildings. Short-term uses become long-term uses. The list goes on. As time stretches out it becomes more and more uncertain what you are actually going to get. That goes to the other key point covered in our comment. The arena, the only concrete thing the ESDC board was approving (and that being only recently identified and described) is a net money-loser for the city, a $220 million net loss. ESDC was unable to address the fact that the arena is a net negative to the city in any way at the meeting except to say that the rest of the project would make up for the loss. Steve Matlin was asked to state to what extent ESDC disagrees with the Independent Budget Office report that says that the arena will be a $220 million net loss for the city accompanied by more than $726 million in no-bid subsidies to a private developer. He was asked to be specific as to what way ESDC disagreed with the IBO assessment. All he could say is that the as-yet-unidentified rest of the project would make up for the loss. Oh, yeah? How does he know? There is no basis to make such calculations. This comment is in the name of Noticing New York, dedicated to the proposition that developing New York and appreciating New York go hand in hand. 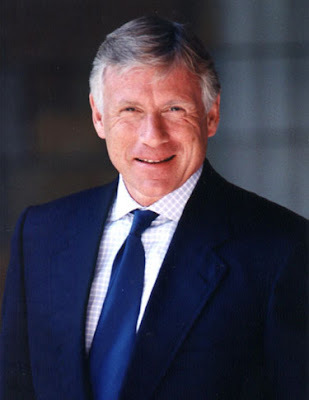 I am Michael White, a lawyer and urban planner. A lot of you know me. I have more than a quarter century experience in government, entrusted with the same kind of responsibilities you now intend to abuse. 2. There is no benefit in the arena. In addition, with no requirement of benefit or corresponding obligation (and again without bid), you are giving a single developer a multi-decade blight-producing monopoly on a swath of valuable Brooklyn real estate. 4. You shower Forest City Ratner now with additional multi-million dollar benefits such as excusing it from its railyard obligations, and we can expect that you will similarly shower more benefits upon them in the future, again without quid pro quo. 5. What you are doing is destructive of neighborhoods, the city, our public finances, destructive of government and destructive of the basic fabric of trust required for a civilized society. 6. Those who have never worked in a public agency and experienced the integrity with which they can operate probably wonder whether this is “business as usual.” It is not. This is cynical corruption, the worst I have ever seen. That was today, but “everybody” had similarly predicted the certainty of today’s board vote as far back as May when the vote was first announced. 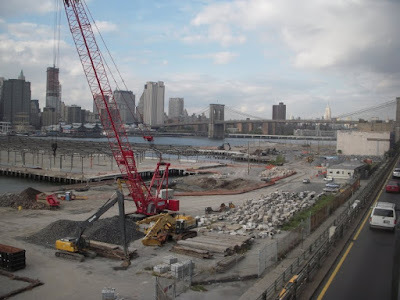 Post-Post Postscript: After we posted this the Atlantic Yards Report posted a lengthening account of the hearing which includes video of our Noticing New York comment at the hearing. See: Friday, September 18, 2009, At ESDC board meeting, new revelations of ESDC's concessions to Ratner and forceful criticisms from opponents (with video).